An 18-year-old woman accused of murdering an admirer told police that she was "sorry for everything that happened", a court heard. Martyna Ogonowska said she went to punch Filip Jaskiewicz in his car in Peterborough in October but forgot she was holding a knife, jurors heard. Cambridge Crown Court was told Mr Jaskiewicz, 23, died after being stabbed in the heart. Prosecutor Andrew Jackson has previously told the court Mr Jaskiewicz was attracted to her and "hoped a relationship would develop". After a night out, Ms Ogonowska, Mr Jaskiewicz and two friends stopped at 04:05 BST on 21 October in Oakdale Avenue, where an argument broke out, jurors heard. The court heard Ms Ogonowska told police in interview that because he was punching her she wanted to punch him back and she "showed him the handle of the knife" in her sleeve. She said she punched him three times "straight on" before a further punch proved to be the fatal blow. She said she tried to stop the bleeding with her hands and said she wanted to call an ambulance, but a friend in the car stopped her. Ms Ogonowska then got out of the car, went to her ex-boyfriend's house where she washed the knife before going to the police station, the court heard. Asked if she intended to kill Mr Jaskiewicz she said: "No, I'm not a murderer. Never." 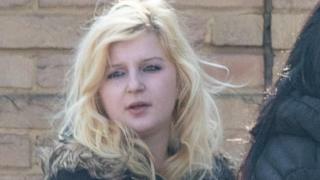 She told police: "I'm very sorry, I'm very sorry for everything that happened... It was an accident."